The Human Restoration Project: New Years Challenge Number Three! New Years Challenge Number Three! In the spirit of keeping things accessible and simple these little challenges are experiments for you all to try. If it makes you feel good - try it for another day. Then take a day off and try again. Each time you may begin to notice you are getting stronger. You will slide back into old habits and that is totally NORMAL. This process is a slow one, no magic bullets, remember? So make it do-able and not punishing or overwhelming. Slow and steady wins the race. What we are looking for is a general movement in the direction of change~~~ not perfection right out of the gate. Reminder: Shoot for 3 days a week to cook at home and not eat processed, packaged food, sugary treats or drink soda during your day. Those few things alone are really BIG STEPS in the right direction. Take the pressure and punishment out of it. Seriously we have all been punished enough. Reach out to me, ask questions in the comment section below, maybe there is a creative solution to an obstacle you've encountered that hasn't entered your mind yet that we can find for you. So you may have had a walk from last weeks challenge, maybe you had 4 or 5 walks maybe that is a solid part of your routine already. If so, EXCELLENT!!! This time - if your knees are solid - go find yourself a flight of stairs or a large hill and CONQUER!! Do some ankle rotations, squats and jumping jacks to warm up for 4-5 minutes. We all know how to do squats and jumping jacks. 4th time SPRINT up those stairs as fast as you can! 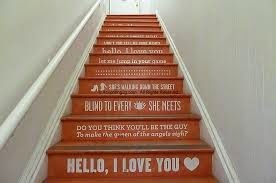 4th time up the stairs. no longer than 10 minutes. Stairs are easy to find, hills maybe a little trickier. My Boston suburb friends, I've got a little list of great hills in the metrowest area if you want them. Doing your hill repetitions outside in the winter can be uplifting for your spirit! and maybe a walking stick if you are not steady on your feet. 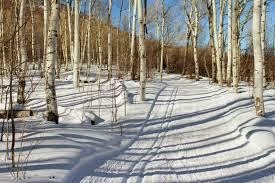 Cross country skiing or snow shoeing are other great ways to get outside and move in the winter months. 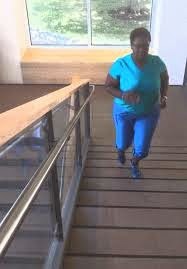 Next week (or sooner if you feel ready) add another sprint up the stairs or hill so you are doing two full sprints up the stairs after your warm up. Try this exercise every other day for one week. Please let me know how you did, and how you feel, because I really want to know. Strong Durable Humans Live Better Lives!